Young musicians between the ages of 18 and 28 who are receiving an education at a conservatory will be taken into the orchestra after the selections that will be conducted in Turkey, Georgia, Armenia, Azerbaijan, Kazakhstan and Ukraine. The Tsinandali Classical Music Festival will kick off on Sept. 8, 2019 in the cultural Kakheti region of Georgia and is scheduled to be held every year. Parallel to the event, the Pan-Caucasian Youth Orchestra, the music society to be established for the festival, will open its doors to young Turkish musicians. Young musicians between the ages of 18 and 28 who are receiving an education at a conservatory will be taken into the society after the selections that will be conducted in Turkey, Georgia, Armenia, Azerbaijan, Kazakhstan and Ukraine. The Pan-Caucasian Youth Orchestra will be in the capital Ankara on Jan. 21 at Bilkent University Music and Performing Arts Faculty and on Jan. 22 at Hacettepe University Ankara State Conservatory. Concerts will also be organized in Istanbul on Jan. 24-25 at Mimar Sinan State Conservatory. The Tsinandali Festival, which has a strong program, will be held as the joint project of the Georgian government and the Silk Road Group and will include Fazıl Say. Among the organizing figures of the festival, there are David Sakvarelidze, the festival director, founders Avi Shoshani, Martin Engström, George Ramishvili and world-famous conductor Gianandrea Noseda, the music director of the festival. Selected young musicians will have a chance to work with legendary conductors, such as Gianandrea Noseda, Jukka-Pekka Saraste, Omer Weir Wellber and Lahav Shani, and famous musicians, including Ying Fang, Ketavan Kemoklidze, Lahav Shani, Fenis Kozhukhin, Yuja Wang and Misha Maisky, along with being a part of a wonderful musical society. The orchestra's rehearsals will continue for six weeks in August and September. In the first three weeks, they will work together with the prominent figures of the world. In the following three weeks, Tsinandali Festival's rehearsals and the orchestra's five concerts will be organized. Applications, participation and all expenses, including travel, accommodation and food, will be covered by the Tsinandali Festival. The orchestra will arrive at Tsinandali on Aug. 16. Their rehearsal will start the next day on Aug. 17 and will last until Sept. 7. They will give five concerts with Gianandrea Noseda, Jukka-Pekka Saraste, Omer Meir Wellber and Lahav Shani between Sept. 8 and 22. One of the missions of the festival is to make the musical language in the Caucasian region the junction point of Europe and Asia. The festival aims to draw the best artists, composers and musicians to Tsinandali from the four corners of the world. It was planned to create opportunities for young musicians so that they can discover the music world and advance their music education through master classes presided over by important figures. 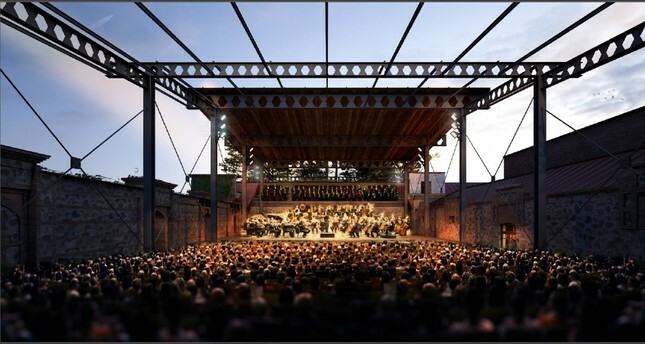 The main concert space of the festival, which will conquer the city, will be the amphitheater with a capacity of 1,200, which was designed by Xavier Fabre, the renowned French architect of many prominent buildings, such as the new stage of Mariinsky Theater in St. Petersburg and the Philharmonie de Paris. About the Pan-Caucasian Youth OrchestraThe art director of the society, which was formed to serve as one of the permanent orchestras of Tsinandali Festival, is Claudio Vandelli. At the end of the selections for the orchestra, which aims to have musicians between the ages of 18 and 28 from the Georgia-Caucasian region, an intense five-week education program awaits the participants. The Pan-Caucasian Youth Orchestra strives to be a leading training orchestra comprising of talented young musicians from Turkey, Georgia, Armenia, Azerbaijan, Kazakhstan and Ukraine.